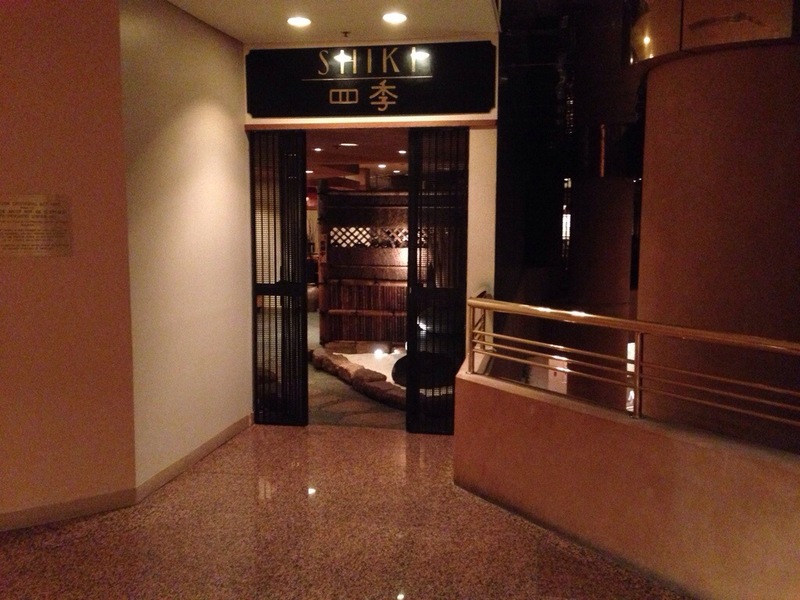 Back at Shiki, at the Intercontinental. Have ordered from the Teppanyaki section of the menu. This is actually the same entree I was given last time I was here. 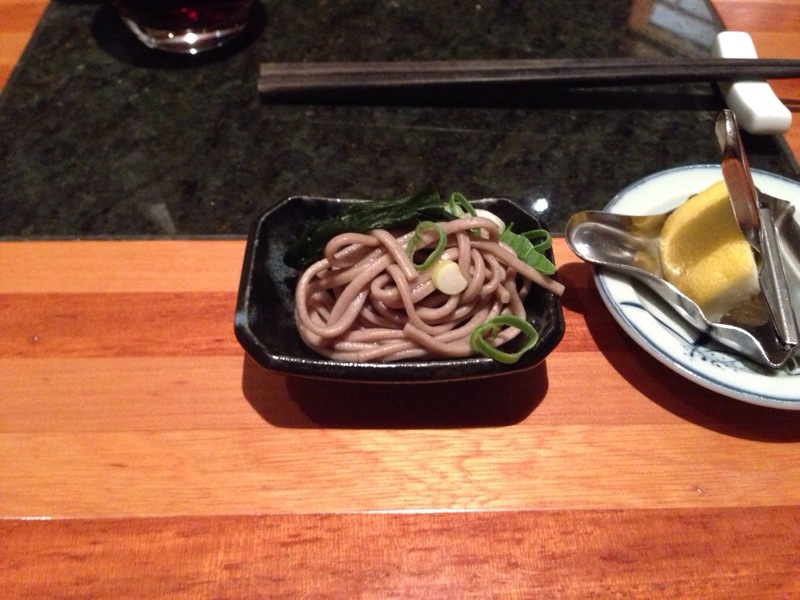 Last time, it was salty and soy-ey, but this time, it was just some cold, thin pasta. The little bits of spring onion added a taste that wasn’t appropriate here. It was just like eating a small amount of spring onion on its own. Plus a serve of shiitake mushrooms and a serve of fried rice. 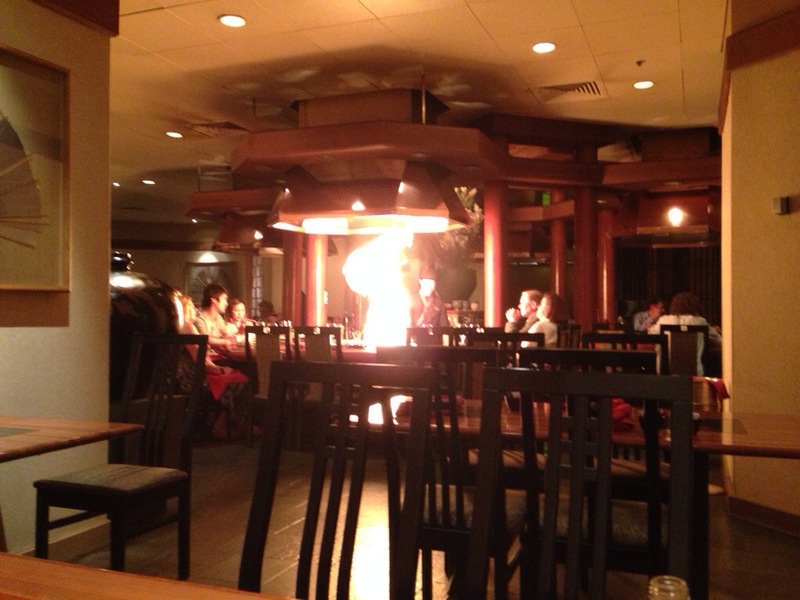 Every five minutes or so, a chef will ignite alcohol on his cooking surface, creating a large burst of flame. 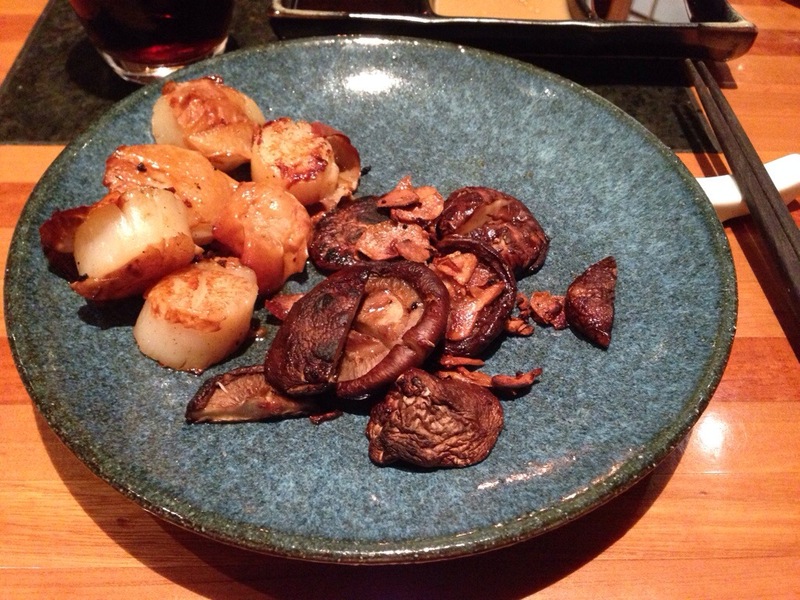 The scallops are soft and have a kind of internal structure. They’re not just uniform mush. The sear on them adds a salty flavour, and the piece of (I think ) rice paper adds some crunch. I dip them in the soy-based sauce, as instructed. The mushrooms are partly cut up, and mixed in with crispy flakes of garlic, which add too much garlic flavour if too many are eaten at once. I dip these fairly plain fried mushrooms into their corresponding sauce, but it tastes like peanuts that have gone off. The mushrooms aren’t really edible alone, so I cease feeding upon them. 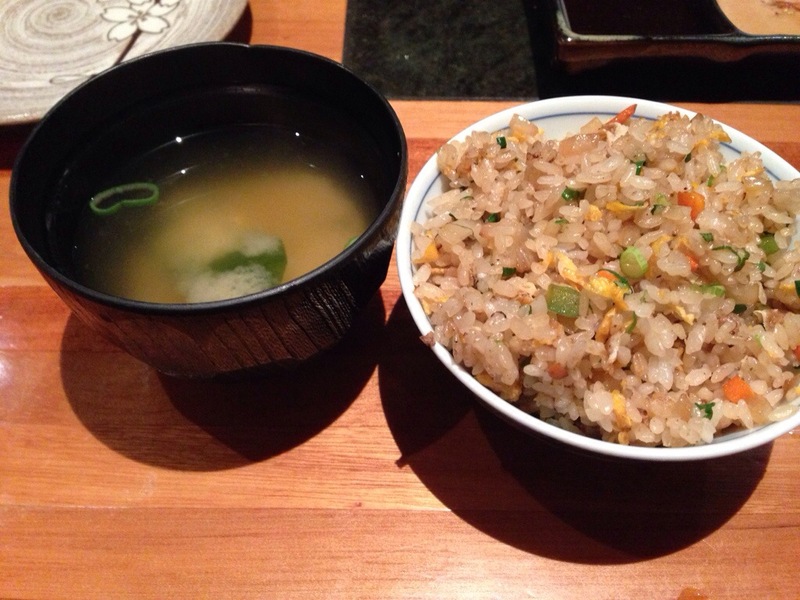 My fried rice and free miso soup arrive after the other dishes are eaten. I start eating the rice with the chopsticks. As ninja-tastic as that is, I can’t be bothered, and just decide to use a spoon. I look for a spoon, but don’t see one. However, I was just given soup, so there has to be something to eat it with. But no. It’s like The Matrix. There is no spoon. Ok. I guess I’m supposed to drink this miso soup. It tastes like the weak vegetable soup it always does. I eventually reach the point where I can’t pick up any more short grain rice from its curved bowl, and lay down my chopsticks. The bowl of fried rice was a worthy adversary. The cake has a strong hazelnut flavour. 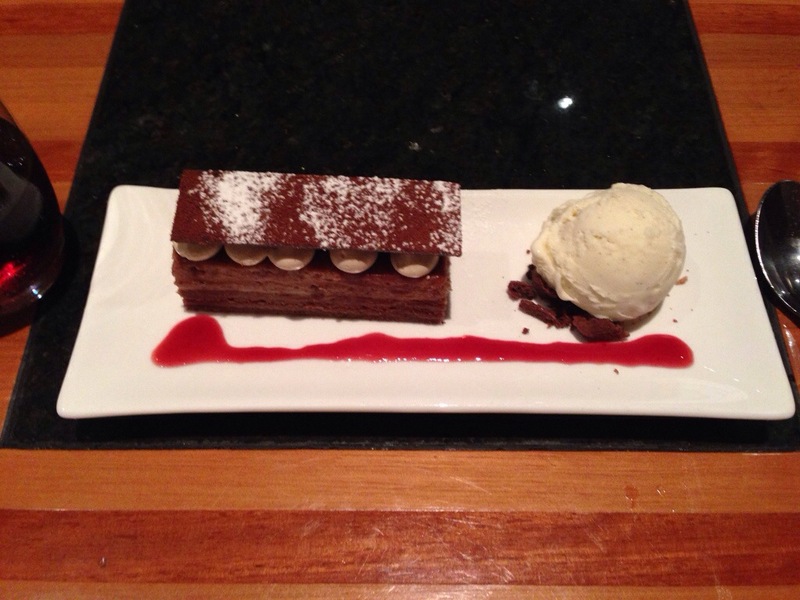 It’s layers are a variety of textures and mild chocolate flavours. The small amount of raspberry coulis here doesn’t really do much.